The Valentine's Day Massacre was a dramatic act of PKing in Yagoton which resulted in the deaths of seventeen survivors. On February 14 2006, RedZeko entered the Whatmore Building, a NecroTech Building near the Yagoton Revivification Clinic. He then announced his intention to murder as many players as possible, and seventeen survivors were apparently killed by his actions. There is a screenshot of the event in question. This was the first mass PK event to occur of this scale known in Yagoton, and possibly in Malton. Also see The Second Massacre of Yagoton. Although not known for sure how RedZeko managed to kill so many players consecutively, it seems likely that a group of confederate characters prepared for the assault by weakening many survivors to the point of death, possibly picking on survivors who were still recovering from revivification. 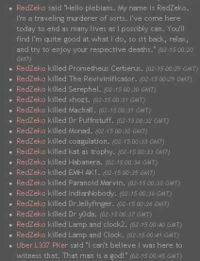 RedZeko could then have taken the credit for each kill by landing the final fatal blows. At least one victim of the massacre mentioned being attacked by several similarly-named characters before RedZeko's killing blow, and RedZeko admits that some of these characters were controlled by the same player and have since been banned for zerging. The Valentine's Day Massacre gave rise to the cult which calls itself the Disciples of Zeko, a human PKer group that praises and glorifies the Valentine's Day Massacre. That group has declared the Whatmore Building as a sacred site, as it believes that it was there that RedZeko ascended into godhood as the "God of Murder". This cult eventually celebrated the day once more with The Second Massacre of Yagoton. For the truth behind the Valentine's Day Massacre and the true actions of RedZeko and the Disciples of Zeko, please visit the Confessions of Zeko. First hand confessions of the Prophet of Zeko, Rozozag, on the truth behind these events. This page was last modified on 14 June 2010, at 14:39.